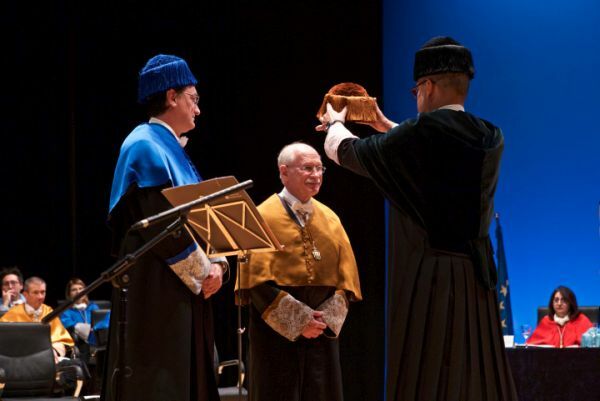 This researcher, regarded as one of the "One Hundred Engineers of the Modern Era", has been presented a University of Alicante honorary doctor degree by University President Manuel Palomar within the context of Saint Thomas Aquinas academic celebrations. The University of Alicante has celebrated today its traditional Saint Thomas Aquinas ceremony in which the University President presented the UA Special Awards to 178 undergraduate, Master’s and PhD students and a honorary degree to Professor Ignacio Grossmann, who was included in the list of the 100 most influential chemical engineers of the modern era” by the American Institution of Chemical Engineers (AIChE) in 2008, as reported by Professor José Antonio Caballero Suárez in his laudation. The event was held in the University Alicante Auditorium before a large audience made up of students with their families, researchers and doctors, as well as a significant representation of social, political and military authorities. As part of the merits in the career of the new honorary doctor by the University of Alicante, proposed by the Department of Chemical Engineering and the Institute of Chemical Processes Engineering, his defender emphasised his research skills, his commitment to education, his interest for knowledge transfer and the application of basic research results to companies. 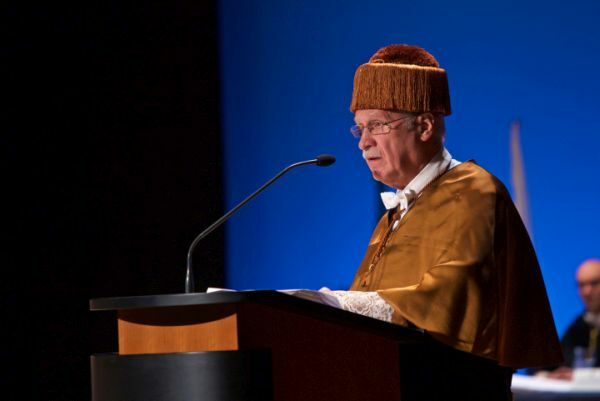 After his inauguration as a new University of Alicante honorary doctor with the presentation of the symbolic attributes of this appointment (a graduation cap, a ring, a book and a pair of gloves) by University President Manuel Palomar, Grossmann defended social responsibility in chemical engineering and research focused on the great challenges of the 21st century: energy, water and global warming. An area in which new technologies are being developed for the production of renewable energies and thus helping make these energies economically profitable and competitive. After that, he took the opportunity to call for a joint research effort based on sound scientific and technological principles, and especially through international cooperation, where to move forward, and thus ensuring a sustainable future for the next generations. He said he has high hopes for the young people in the audience, who will conduct their efforts to solving these great challenges of the 21st century. Ignacio Grossmann expressed his gratitude to the University of Alicante for this great honour and stressed that his collaboration with the group of the University of Alicante has been very fruitful as it has in fact resulted in the production of more than 40 scientific articles that have been published in international journals and have been presented at conferences around the world. The University of Alicante and Spain can feel very proud to have the Institute of Chemical Processes Engineering and the Department of Chemical Engineering due to its high scientific level, as well as its international prestige that I have been able to personally witness. In his address to a packed auditorium, Grossmann said that one of the greatest satisfactions of doing research in this area is that we can strike a balance between theory and practice and quoted John F. Kennedy to defend the relevance of promoting new ideas and new solutions to solve technical and social problems: "The problems of the world cannot possibly be solved by sceptics or cynics whose horizons are limited by the obvious realities. We need men who can dream of things that never were". Manuel Palomar was in charge of closing the ceremony after the presentation of the special awards for undergraduate, Master's and PhD students. The University President congratulated the new graduates for their success and encouraged them to be an example of ethical behaviour of the UA students in their professional practice, to be permanent ambassadors of their values of tolerance, critical spirit and responsible behaviour. He also talked about our society’s expectations on them to reach a fairer, freer and more supportive world for which, he said, they will be able to rise to the occasion. On the new UA honorary Doctor Professor Ignacio Grossmann, the UA President highlighted his brilliant academic and scientific background and the close scientific relations with researchers at our university, which has allowed us to collaborate fruitfully on projects and in articles published in internationally leading journals. 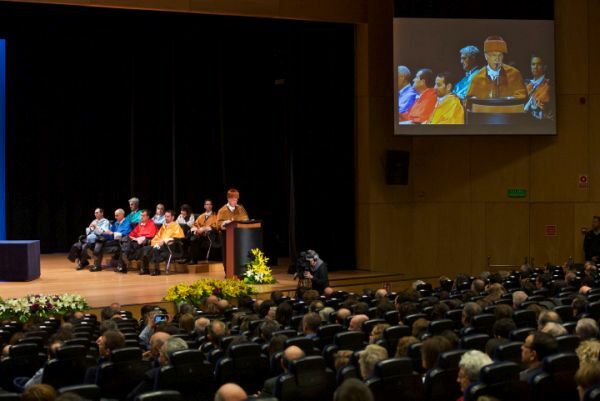 Palomar pointed out that different aspects have been valued in the achievement of his honorary doctorate, his relevance as a researcher, his commitment to the training of researchers, his close relations with our university and his scientific impact. In his speech, the UA President stressed the need to succeed in shaping an innovative education model that will require profound changes in research and teaching, in management and in the social projection of university activity: an organisation that learns in the unavoidable environment of a learning society. Palomar assured that he assumes as his own the project of turning the University of Alicante into a socially responsible university. A university committed to the promotion of the values of a democratic, supportive and sustainable society within the framework of a competitive and innovative economy, engaged not only in the transmission of knowledge but of attitudes and values. A university that assumes, in each of its activities (teaching, research, management and external projection) goals of adaptation and improvement, and a better and closer relationship with the institutions and organisations nurtured by it which give it meaning.